was born at St. Helens, Lancashire, April 29, 1879, son of a wealthy patent pill manufacturer and civic leader. When he was 7 he was precociously studying the opera scores of Wagner, and at 10 he organized an amateur orchestra. He first visited America with his father, who came on business in 1893. Young Thomas was educated at Rossall School and Wadham College, Oxford, and by extensive foreign travel. Having already conducted the Halle Orchestra in his teens, he first appeared as a conductor in London in 1905, and in 1906 he organized the New Symphony Orchestra with family funds. After a fine beginning, that venture failed and Beecham founded another--the Beecham Symphony Orchestra, with which he gave concerts until the beginning of World War I. By 1911 he was in charge of opera at Covent Garden; during this stage of his career he produced some 120 operas, about half of them new to British audiences, or long neglected. In 1911 he introduced Diaghilev's Russian Ballet into England, as well as Russian opera with Chaliapin, Wagner cycles, and first performances in England of major works by Richard Strauss and operas by several British composers. In 1916, upon his father's death, he succeeded to the title of Baronet and a huge inheritance; he was knighted on January 1, 1916, for his services to music, and opera in particular. During World War I he financed orchestras and opera companies all over England, including the Beecham Opera Company, which moved in to fill the void when Govent Garden closed. After the war, the Beecham's Pills fortune was exhausted and funds supplied by Lady "Emerald" Canard and other music patrons had declined. In 1957 he was named a "Companion of Honour, one of England's highest distinctions, but most of the year was spent in semi-retirement in his home at St. Jean Cap Ferrat, near the French Riviera. He emerged upon the death of his friend Jean Sibelius to conduct his music and that of others all over the Continent, and to make many important recordings. Sir Thomas died in London on March 8,1961, at the age of 81, of a second cerebral thrombosis. He had been ill for several months and had cancelled a number of engagements in Europe. America heard him last in early 1960. He was married three times: first in 1903 to Utica Celestia Welles of New York, their marriage ending in divorce in 1943. Soon after he married the English pianist Betty Humby, who died in 1958. In 1959, he married his former secretary, Shirley Hudson. He had two sons by his first marriage. 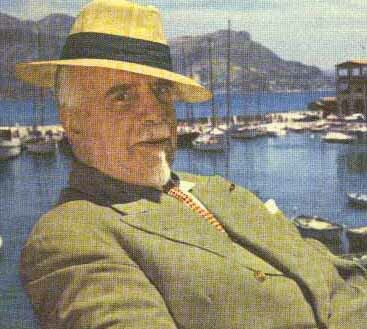 SIR THOMAS BEECHAM è stato sopportato alla st Helens, Lancashire, 29 aprile 1879, figlio di un fornitore ricco della pillola di brevetto e guida civica. Quando era 7 precociously stava studiando i segni di opera di Wagner ed a 10 ha organizzato un'orchestra dilettante. In primo luogo ha visitato l'America con il suo padre, che è venuto sul commercio in 1893. Thomas giovane era istruito alla scuola di Rossall ed all'università di Wadham, Oxford e dalla vasta corsa straniera. Già conducendo l'orchestra de Halle nei suoi anni dell'adolescenza, in primo luogo è comparso come conduttore a Londra in 1905 ed in 1906 ha organizzato la nuova orchestra di symphony con i fondi monetari della famiglia. Dopo un inizio fine, quell'impresa è venuto a mancare e Beecham ha fondato un altro -- l'orchestra di symphony di Beecham, con cui ha dato i concerti fino all'inizio del world.war.i. Entro 1911 era incaricato dell'opera al giardino di Covent; durante questa fase della sua carriera ha prodotto circa 120 opere, circa la metà di loro nuove ai pubblici britannici, o lungamente ha trascurato. In 1911 ha introdotto il ballet russo di Diaghilev's in Inghilterra, così come l'opera russa con i cicli di Wagner, di Chaliapin e le prime prestazioni in Inghilterra degli impianti importanti da Richard Strauss ed opere da parecchi compositori britannici. a 1916, sulla sua morte di father's, è riuscito al titolo del baronet e di un'eredità enorme; knighted il 1 gennaio 1916, per i suoi servizi a musica ed all'opera in particolare. Durante il world.war.i ha finanziato le orchestre e le aziende dappertutto Inghilterra di opera, compreso il Beecham Opera Company, che si è mosso dentro per riempire il vuoto quando il giardino di Govent si è chiuso. Dopo la guerra, la fortuna delle pillole di Beecham's è stata esaurita ed i fondi monetari sono stati forniti dal "Emerald" della signora; Il canard ed altri patroni di musica avevano declinato. Beecham reso al suo debutto americano in 1928 ed il seguente anno ha presieduto un festival di Delius a Londra. In 1932 è diventato conduttore principale del festival de Leeds, ospite-ha condotto New York Philharmonic ed a Salisburgo ed ha fondato l'orchestra de Londra Philharmonic con le finanze personali rinforzate. Il concerto di Beecham's primo Londra con quell'orchestra, secondo il dizionario di Grove's, "indisputably ha confermato la sua reputazione come il executant britannico più grande del century." In 1933 è diventato direttore artistico del giardino di Covent ed ha tenuto quella posizione per sette anni con luminosità d'aumento delle prestazioni e varietà di repertoire" In 1938 il presidente della Francia conced su lui la decorazione della legione di honor. Le apparenze dell'ospite con le varie orchestre americane lo hanno portato frequentemente a questo paese ed ha speso la seconda guerra mondiale che conduce in America (il più considerevolmente all'opera metropolitana), nel Canada, in america latina ed in Australia. Il suo autobiography, "A ha mescolato il carillon, ' è stato pubblicato in 1943 e durante il seguente anno ha rinviato in Inghilterra. In 1947 ha fondato l'orchestra reale di Philharmonic, un insieme raccolto a mano che ha addestrato e registrato con fino vicino alla conclusione della sua vita; hanno fatto un giro insieme degli STATI UNITI e del Canada in 1950. (dopo che morte di Beecham's sia annunciato dalla signora Beecham che Rudolf Kempe, conduttore del socio dal 1960, era stato nominato conduttore principale dell'orchestra.) In 1957 è stato chiamato un "Companion di honour, una di più alte distinzioni di England's, ma più dell'anno è stato speso in semi-retirement nella sua sede alla protezione Ferrat della st Jean, vicino al riviera francese. È emerso sulla morte del suo amico Jean Sibelius per condurre la sua musica e quella di altre dappertutto il continente e per fare molte registrazioni importanti. Il sir Thomas è morto a Londra su marzo 8.1961, all'età di 81, di una seconda trombosi cerebrale. Era stato malato per parecchi mesi ed aveva annullato un certo numero di impegni in Europa. L'America lo ha sentito l'ultima volta all'inizio di 1960. È stato sposato tre volte: in primo luogo in 1903 a Utica Celestia Welles di New York, la loro conclusione di unione nel divorzio in 1943. Presto dopo che sposi il pianist inglese Betty Humby, che è morto in 1958. In 1959, ha sposato la sua ex segretaria, Shirley Hudson. Ha avuto due figli dalla sua prima unione. 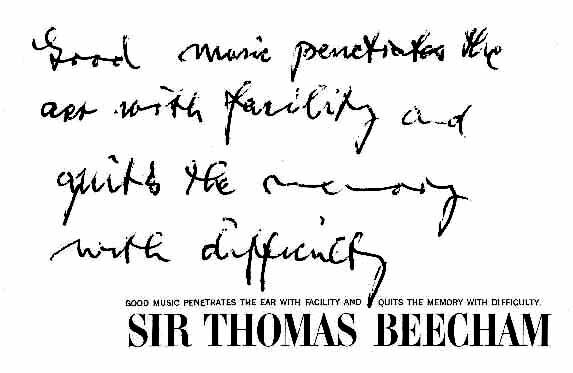 WITH THE DEATH of Sir Thomas Beecham, England has lost her greatest executive musician, possibly the greatest that she has ever produced, and the world has lost a conductor of genius. Sir Thomas was not only a musician-he was famous as a wit, controversialist, orator, was an accomplished writer, was deeply read, had travelled widely and was a man armed at all points. It is unlikely that we will be entertained by his like again because he was a product of his age and the age has ended. Only by the union of genius and inherited wealth operating in an age of privilege could such an artist be produced. Possibly the genius will be forthcoming but the wealth and the privilege have been swept away--no doubt a man endowed with such outstanding gifts will make his mark in any society and in any age but certainly he cannot make the same kind of career and travel by the road that was chosen by Sir Thomas. Often his methods were extravagant and infuriating to others but the results were usually of the finest, and those who had obeyed the rules and plodded along the orthodox highway rarely scaled the heights that were his by the virtue of his natural talent and irregular development. As a child I was frequently taken to hear him conduct; as a young man I slipped into his rehearsals uninvited. I met him over thirty years ago but it was only after the war that I began to work with him regularly. From 1946 until his death few weeks passed without some meeting or communication. Our meetings took place in many countries, in widely differing surroundings, at all hours of the day and night, and on occasions gay and sad. There were milestones such as the luncheon given by Electic & Musical Industries Ltd., on his 70th birthday and attended by many famous people, and the dinner party given by himself on the evening of his 80th birthday to a small group of intimate friends of which I was privileged to form a part. On all these occasions-large or small-Sir Thomas dominated the proceedings and rarely failed to entertain. The art of the great conductor seems to me to be magical and inexplicable. That a great singer or instrumentalist by infinite experiment and repetition should develop his or her art until it becomes unique is only natural and easily understandable. That a conductor with a powerful personality, deeply felt convictions about music and much experience working invariably with the same orchestra should influence these men to the point at which they absorb much of his feeling is also only natural. But that a different body of men, who have been working possibly with another conductor, with views wholly different, should after a few hours' rehearsal reproduce to perfection his inimitable interpretation is truly miraculous. I have had opportunities given to few people to listen time after time to the greatest conductors in rehearsal, have on many occasions discussed the fascinating subject with the conductors themselves, with dozens of the most gifted orchestral players, and with soloists, and I have never heard anyone give a really convincing explanation. Of course the dry bones of the matter are easily laid bare, but the spirit evades capture. Sir Thomas was one of that very rare and exclusive company capable of producing these results, and I heard him do so in England, America, France, Germany and Italy. Command of a common language was not essential-he had no difficulties with the best French orchestra when he returned to Paris a few years ago--they started to work for him with apprehension but at the end of the first session they gave him a great ovation. Temperamentally there have been immense differences between the great international conductors, but they all have one thing in common--a passion for music and a great deal more energy, mental and physical, than the average individual. Although they have been granted these exceptional powers of endurance I have also observed that they have been aided, firstly, by an economy of effort, as they know their job to perfection and achieve the best results with the minimum of strife; secondly, because they know how to relax when not working; and thirdly, because the more celebrated they become the less they have to fritter away their energies in futile activities--in other words they sit still and people come to them. Certainly the octogenarian conductors are a very remarkable phenomenon. I have seen Pierre Monteux conduct during one day for nine hours at the age of 82, Tullio Serafin stand up conducting for six hours and in between take a piano rehearsal at 80, and Toscanini conduct for four hours without a break, also standing, and afterwards engage in an animated conversation with me for forty minutes calling on a memory apparently unimpaired by age at 83! Sir Thomas was in this class. Once I was in New York by pure chance when he happened to be there. On returning to my hotel after midnight I found a message asking that I should go round to his hotel no matter at what hour I returned. It was only one block away and he had a suite on the sixteenth floor. When I arrived, there were five people in the sitting room and a great deal of cigar smoke. It was obvious at a glance that, with the exception of Sir Thomas, they were all in the last stages of exhaustion and probably semi-asphixiated by the cigar smoke which had been created by him. He was as fresh as a daisy. They were setting up some kind of a Trust and I was asked to answer some questions related to royalty payments. After giving my opinion I was glad to make my escape and go to bed while this unfortunate group of lawyers and tax experts settled down to a long session, cross-examined by their redoubtable client, who was approximately double their age! My heart bled for them! Similarly my old friend Samuel Chotzinoff, who for many years acted as the link between the National Broadcasting Corporation of America and Toscanini, told me that when he and his family stayed with the Maestro they had to organise themselves into watches to cope with his extraordinary activity, as he only needed four hours sleep each night and could not understand why everyone was not about the rest of the day; at least one of them had to be available! Sir Thomas' conversation was inclined to be a monologue-but what a monologue! He had met everyone worth meeting since the age of 25 and his acquaintances were by no means confined to musicians, although of course they were well represented. His intelligence, wealth and position in the musical world, aided no doubt by what was regarded then as an orthodox education, had carried him early into exclusive circles which were then much more difficult to penetrate than now. There were few people whom he had not met and of whom he could not talk with real knowledge and understanding. He had brought Chaliapin and the Russian Ballet out of Russia to London for the first time; he had known most of the leading British politicians. He had conducted for Saint-Sacns, dined with Mark Twain and stayed with Grieg and his wife in Norway. Edward VII had often visited Covent Garden during his regime. He was a close friend of Richard Strauss and had produced his greatest works for the first time in this country; he had interesting things to say about Puccini; he was connected closely with "Les Six" in France. As a boy he had been to Chicago with his father when, to use his own words, "It was still a city of shacks" and he had lived to see it grovv into the impressive city of today. In fact he had travelled all over the world and he had been a most discerning observer. By nature if not by birth he was an aristrocrat, preserving the standards of refinement and elegance which should be the justification for aristocracy, while he demanded the privileges which are its natural reward. Whereas many great musicians are indifferent to their surroundings, Sir Thomas owned splendid pictures, prints, furniture, books and silver, appreciated their beauty and set them out to great advantage. He was a considerate host, a gourmet-nothing pleased him more than to choose, with long experience to aid him, a short but well balanced meal--and his knowledge of wines was discerning and refined. This same refinement he carried into music--unless he set out deliberately to shock. When it came to choosing singers he demanded the same standard of good taste that he had acquired by right. They were not always easy to find. In my experience he would do nothing to train singers, but once he found those whom he liked he would do wonders to assist them. For example, in his recent recordings of "Carmen" and "The Abduction from the Seraglio" he made great demands on the singers but he lavished a lifetime of experience and sensibility on their accompaniment. Vulgarity in music he could not abide, but a bucolic vigour in the right place he admired. When listening to a test of a baritone--not chosen--for "Carmen" he turned to me and said, "David, he's made a mistake, he thinks that he is the bull instead of the Toreador!" On the other hand when discussing a projected recording of Handel's "Acis and Galatea" he said, "We'll never find anyone as good as that rumbustious old Australian baritone Peter Dawson for 'Oh ruddier than the cherry'" A year later I met Peter in Sydney, where he is living in retirement, and told him of this remark, much to his amusement. He had a good earthy side to his own character. Football Cup Finals, wrestling and boxing amused him immensely. He thought that the television advertisements-particularly in the United States- were a perfect scream and he loudly proclaimed that nothing better in its line than the vacation town of Blackpool in his native Lancashire had ever been created. He was a master at relieving the tensions of recording by producing some new anecdote or witty sally. As the years went by his methods of recording became more and more apparently disorganised. For example he would make a test of a bit of a heavily scored Strauss tone poem and then, to the fury of the engineers, change to a delicately orchestrated piece of Bizet needing new microphone positions. In fact there was much more method than appeared at first sight in his goings on. If he abandoned temporarily the Strauss it was because some passage had displeased him and he needed time to consider what he would do about it. With his vast experience of recording very often he would get the effect he wanted by some change in bowing or even a change in orchestration. Sometimes this would not suffice and he would say to us, "I can do no more-you must bring out that cor anglais passage" (or whatever it might be ).Under his hand the orchestra developed great flexibility and clarity of texture. The difference between the first reading of a piece and its final form was often a marvel, and he loved to lavish all his skill on a second class composition which had caught his fancy-such pieces as Massenet's "Last Sleep of the Virgin" and the minor pieces of Delius. He knew perfectly well how slender they were and often I heard him say, "I don't know what more you can do with the damn thing!" In fact he liked a great deal of music which most people considered second rate. Conversely he ran down in conversation many venerated figures. Although he liked to conduct the Second Brahms Symphony, frequently he referred to "that old bore Brahms!" When recording the third movement of the Beethoven Seventh Symphony he said to me, "What can you do with it?--it's like a lot of yaks jumping about." Of course he shared the love of all great musicians for the bulk of classical music and never intended remarks such as these to be taken very seriously; but he had an impish side to his character which delighted in twitting the overrespectable. Nevertheless' he was sincere in considering that the French were much more gifted than the Germans as orchestrators, regarding the "Symphonie Fantastique" as a miracle of brilliance and effect; his dislike of Brahms and some Beethoven was for their alleged thickness of texture. From his point of view this was quite logical, as he liked elegance, wit, brilliance and melody. His personality was too strong and his convictions held too sincerely to allow him to make many compromises in interpretation, and certainly he was uneasy in the role of instrumental accompanist, disagreeing with many soloists' readings. What of his personal character? No doubt a book will be written on the subject, but not by me. In my dealings with him, invariably he was courteous and considerate. I never heard him fly into the rages that were not unusual with Toscanini. Contrary to general belief it was his habit to speak well of his contemporaries; in fact I rarely heard him discuss voluntarily colleagues who were living, but sometimes he showed interest in an eminent contemporary. When Victor de Sabata was enjoying great success in London soon after the war, he asked me to bring him to tea and they got on famously together. In fact so well that there was some talk of their sharing an opera season, at which Sir Thomas should direct "Zauberflote" and "Die Meistersinger" and de Sabata"Otello" and"Falstaff"
In his dealings with individuals he inspired, as I have said, respect and in many deep devotion. Although he was capable of treating many people with great generosity there was some strange twist in his nature which forced him from time to time to dismiss associates who were, in fact, devoted to his interests. His wit was often so brilliant that in a phrase he could annihilate a colleague if he chose to do so and these mots went the round of the international musical world. But in most cases I think that they were not meant to kill. State aid, such as has become essential for most artistic undertakings in Great Britain today as a result of our punitive scales of taxation, was abhorrent to Sir Thomas; and he detested all forms of bureaucratic interference. When the B.B.C. first formed their Symphony Orchestra, which in later years recorded with Toscanini, they offered the direction to him. He refused and was quite right to do so, as it would have been impossible for him to provide the sort of service which presumably they had in mind. His reply was to found the London Philharmonic Orchestra. At the end of the war this orchestra, which had held together by their own efforts in his absence in the United States, asked him to return as conductor, leaving the business arrangements in other hands. He turned down the offer and refounded the Royal Philharmonic Orchestra, in which he directed everything. To keep an orchestra alive and occupied and make it as good as any other in the world, without State aid, was a remarkable achievement. He did more than that; he took them on a highly successful tour in the United States in 1950 and intended to repeat the tour in 1961 with Ansermet as joint conductor. In recent years they paid several visits to the Continent. His ability to extract money from other people to sustain his projects was unparalleled. Once he said to me, "I never go to a financial meeting without having some brick in my pocket" He knew very well when to hurl it and usually it caught the recipient squarely on the nose! His stay there only lasted a few months and off he went to nearby Vence, where he rented a Villa belonging to Michael Cherniavsky; then he turned up in Paris and for a time was at Lausanne. For a few days he was at Geneva, where I went with him and his wife for a steamer trip down the lake and back; the steamer had a very asthmatic siren which he loved to imitate, to the astonishment of the staid Swiss. In the middle of these wanderings he went off to Argentina, where he carried through triumphantly a season of opera at the Teatro Colon, and he demonstrated once more the extraordinary breadth of his musical taste in conducting "Otello" "Carmen,' "Samson and Delilah,'"Don Giovanni" and "Fidelio"
The tour of the United States which he undertook in the early months of 1960 would have been a very exhausting one for a man half his age. For Sir Thomas it was particularly tiring owing to a virus infection which he contracted at the beginning of the tour and to the exceptionally bad weather, which prevented flying and necessitated long train journeys, often at night. On his return to London he was utterly exhausted and never recovered his health fully. During his long lifetime he talked and often belaboured the British music public into appreciating areas of music hitherto unknown and unappreciated by them. No one could have been more scathing about their Philistinism or made more assaults on some of their cherished musical illusions, but all this fundamentally was a facade. At heart he was a great Englishman, proud of his race, ready to join battle, as I heard him do on many occasions, with anyone who ran it down. In his person he had many characteristics which used to be regarded as typically English-the short, stocky build, the splendid head and the pugnacious manner, allied with great personal charm. In private conversation, in spite of many odd and fascinating facets of character, he gave the impression that he represented the accumulated wisdom of many generations, a characteristic which one often finds in men of his distinction in the Old World. I continued to see him at frequent intervals until shortly before his death. As Sir Malcolm Sargent has related, he became mellower in his last days, but the brilliance of his mind and his command of the memorable phrase remained unimpaired. During our last talk together he said how much he loved France and told me of his plans to visit the Chateaux in the Loire again this summer and he agreed that Azay le Rideau was the best. The talk turned to famous singers of the past, a subject that always amused him, and I recall that he said that accompanying Tetrazzini was like "taking part in a cavalry charge--hell for leather. Oh, it was most exciting"
"Amid universal goodwill and widespread affection he celebrated triumphantly his eightieth birthday. But thereafter hungry Time began to revenge itself upon one who had so long disdained its menace. He became an invalid. His body was stricken, but his mind retained, almost to the very end, its clear, tranquil outlook upon the human scene, and its inexhaustible pleasure in the processes of thought. "I had the privilege of visiting him several times during the last months of his life. I saw with grief the approaching departure, and-for all human purposes --extinction, of a being high-uplifted above the common run. As I observed him regarding with calm, firm and cheerful gaze the approach of Death, I felt how foolish the Stoics were to make such a fuss about an event so natural and so indispensable to mankind. But I felt also the tragedy which robs the world of all the wisdom and treasure gathered in a great man's life and experience, and hands the lamp to some impetuous and untutored stripling, or lets it fall shivered into fragments upon the ground"
"Handel and Other Unrelated Subjects"
priced as if it were Three single CDs. is priced as if it were Two single CDs. 5) Sarasate:Zapateado, Falla El Amor Brujo, Theodoradakis: Lovers of Tervel. priced as if it were Two single CDs. Tchaikovsky:Symphonie n. 6 - 2nd and 3rd mvt. I trasferimenti del CD direttamente dal LP o vivono nastri. Nessuno sforzo è stato fatto filtrare il suono del materiale. A causa dell' antichità degli originali, chiediamo gentilmente all' ascoltatore di capire che alcune delle registrazioni abbiano dispersione di superficie. Tutti diritti riservato. Stampato in italiano. Per distribuzione in Italia.